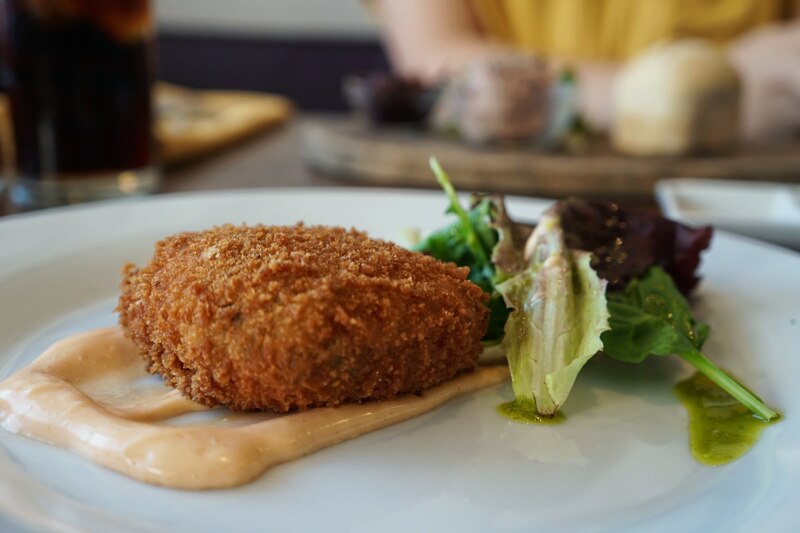 This week we went along to 81 Beach Street to try their lunchtime menu. Nearby parking and prime positioning on the seafront make 81 a hot spot for people visiting Deal for the day. We know it as our local “nice restaurant” somewhere for a good meal with the family on a birthday or for a Mother’s day roast. We’re not alone in this, a table of four next to us were having a birthday meal. The restaurant was full and people were being turned away on a Thursday afternoon. It's clear the lunchtime menu is popular, and it’s a great deal- £10 for two courses and £13.25 for three. 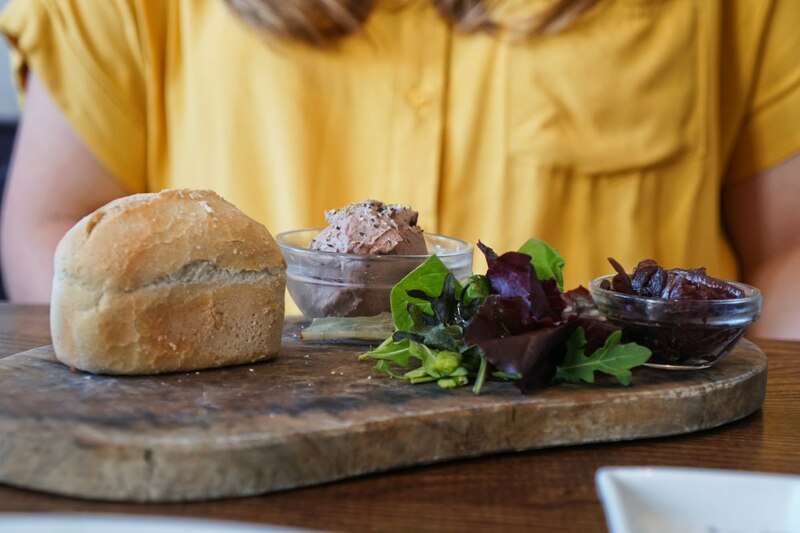 To start we tried the chilli and lime fish cake with sriracha mayo, and the chicken liver pate with hot bread and red onion marmalade. The fish cake was a light and fresh dish with a mild heat to it. The outer shell was golden and crunchy and there was a good ratio of fish to potato. While the chicken liver pate was meaty rich and smooth. The bread was shaped like a cute mini loaf of bread. A dish of red onion marmalade added a nice contrast. Both starters are a good choice as a balanced and light start to the meal. 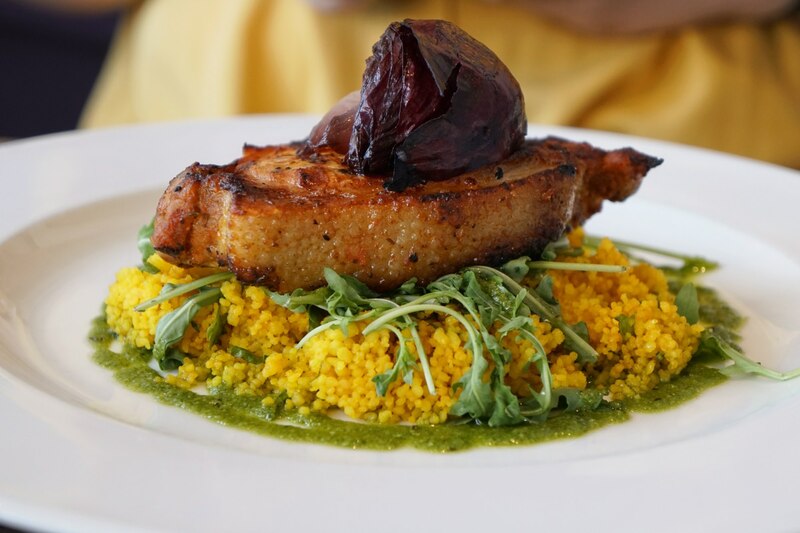 Next, we moved on to the Cajun pork steak with couscous rocket and almond pesto. The first thing to notice is the colours, the couscous is bright yellow with orangey pork and purple onion. A bright appetising dish, it tastes great too. The couscous is airy and lemony with herby vibrant flavours popping up. The pork steak is smoky and succulent with a delicious sweet charred onion sitting on top. Perfectly cooked so it could be pulled apart layer by layer. 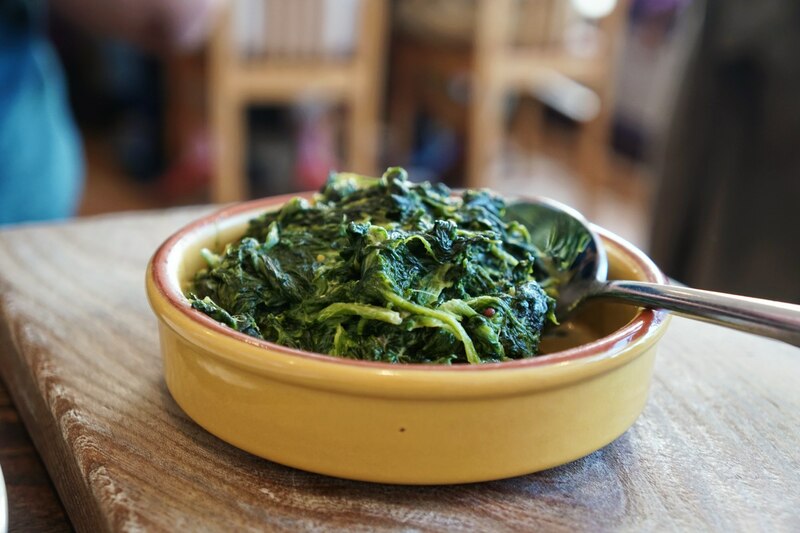 We chose a creamed spinach side dish to accompany our mains, a pretty decent dish full of richness and fresh greens. 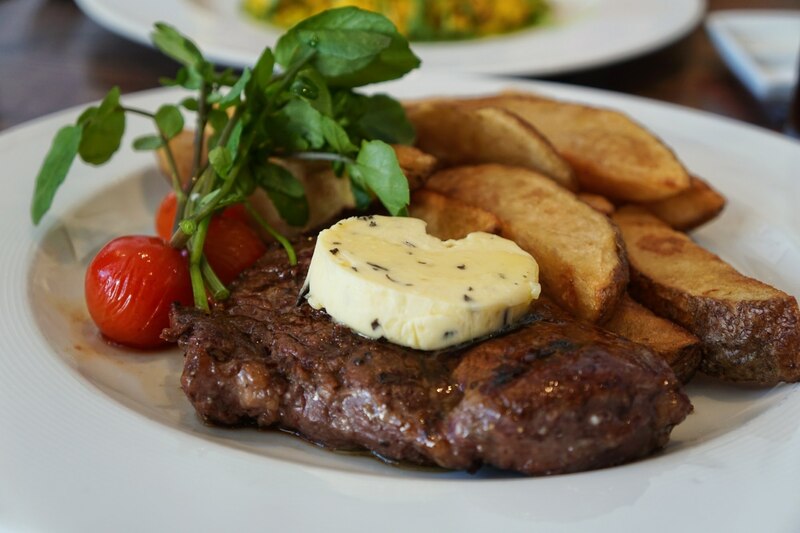 We also had the 6oz rump steak, skin on chips, cherry tomatoes and watercress with a garlic and rosemary butter. The steak was great quality, perfectly cooked and delicious. We especially liked the butter since it stayed perfectly in position while we took photos and melted beautiful when we started eating, releasing great salty garlic flavour all over the dish. The skin on chips- more like wedges were a real highlight. Robust flavourful potatoes fried golden. When salt hits a crisp potato skin, magic happens. Completely moreish and satisfying. Something else we were treated to was great service from the team. In particular, our waitress Phoebe who made sure everything ran smoothly for us and was very attentive during each course. With two courses under our belt and dessert still to come we were feeling pretty full. The options on the dessert menu made it a tough choice as there were a few puds that caught our eye. 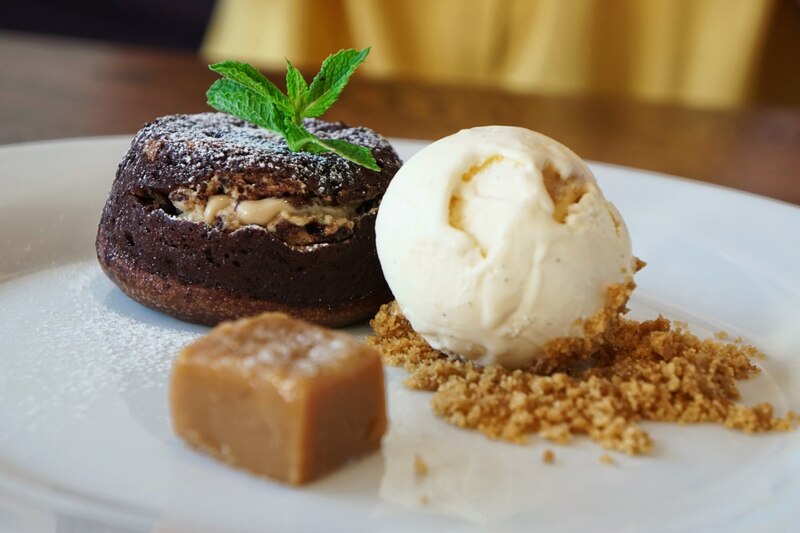 We ended up sharing the peanut butter and chocolate fondant- an item from the a la carte menu, which seemed too good to miss. When it arrived even the birthday table next to us were wowed and we were presented with a trio of sweet items to explore. The chocolate fondant, rich and dark on the outside opened and had a gooey and oozing centre. The peanuts clashing with the velvety fondant and salty peanut butter flowing with the chocolate made for something truly delicious. The vanilla ice cream sitting on a bed of gingerbread crumbs, perhaps not needed as the ice cream was so delicious it could be left by itself. Nonetheless, it was a nice touch. The final item, a little cube of salted caramel was butterscotch brown and topped with flakes of sea salt. The satisfaction of cutting into it with a spoon melted away as the intense salty and sweet flavour took over the taste buds. Smooth soft and rich this little nugget of salt and sugar was one of the best moments from the meal. 81 is not somewhere we’d usually choose for lunch out. But it was really great to venture out from our regular places and go for something a bit different and sophisticated. It definitely felt special to treat ourselves. We don't get to eat out too often so when we get somewhere disappointing or have bad service its a real downer. At 81 we had a great time, loved the food and service and it felt like a real event. The courses are filling and bargain prices for the standard of food. It’s a deal worth taking advantage of if you’re ever looking for a special lunch.